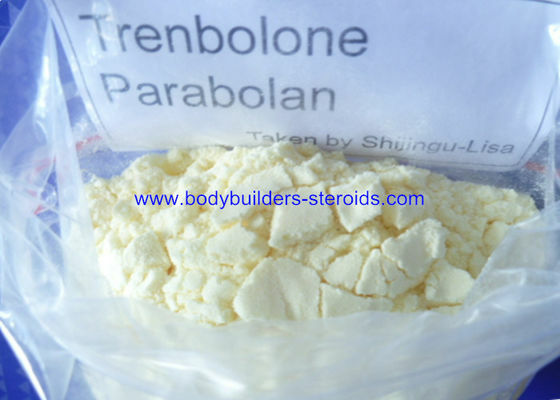 Parabolan contains a much different ester, trenbolone hexahydrobenzylcarbonate. This ester extends the activity of the drug for more than two weeks, a more suitable design for human use. Parabolan is packaged only in ampules of l.5ml, one ampule per a box. Each ampule contains 76mg of trenbolone hexahydrobenzylcarbonate, equivalent to 50mg of trenbolone base (French drugs commonly make this calculation). The anabolic effect of this drug is often compared to popular bulking agents such as testosterone or Dianabol, with one very important difference. Trenbolone does not convert to estrogen. This is indeed a very unique compound since mass drugs, almost as a rule, will aromatize (or cause other estrogen related troubles) heavily. When we think of taking milder (regarding estrogen) steroids we usually expect much weaker muscle growth, but not so with Parabolan. Here we do not have to worry about estrogen related side effects, yet still have an extremely potent mass/strength drug. There is no noticeable water retention, so the mass gained during a cycle of Parabolan will be very hard and defined (providing fat levels are low enough). Gynecomastia is also not much of a concern, so there shouldn't be any need to addition an antiestrogen if trenbolone is the only steroid administered. The high androgen level resulting from this steroid, in the absence is excess estrogen, can also accelerate the burning of body fat. The result should be a much tighter physique, hopefully without the need for extreme dieting. Parabolan can therefore help bring about an incredibly hard, ripped physique and is an ideal product for competitive bodybuilders. This is of course no secret, and when available on the market, Parabolan was the most sought after contest preparation drug. Now this it is no longer produced, acceptable substitutes for this purpose include of course veterinary trenbolone acetate preparations, as well as Halotestin, Proviron and Masteron (also recently discontinued). Trenbolone is notably more potent than testosterone, and has an effect that is as much as three times as strong on a milligram for milligram basis. Likewise we can expect to see some level of androgenic side effects with use of this compound. Oily skin, aggressive behavior, acne and hair loss are therefore not uncommon during a cycle with this steroid. The androgenic nature of this drug of course makes it a very risky item for women to use, the chance for virilization symptoms extremely high with such a potent androgen. And since the hexahydrobenzylcarbonate ester will extend the activity of this drug for weeks, blood levels can be very difficult to control. Since many of the masculinizing side effects associated with steroid use can be permanent, women considering the use of this compound should take extreme caution. It can be weeks before blood levels decline should a problem become evident.